West Palm Beach, FL – The South Florida Water Management District (SFWMD) Governing Board yesterday approved building a major component of the congressionally authorized Central Everglades Planning Project (CEPP) needed to move additional water south. SFWMD will build the new S-333N water control structure in western Miami-Dade County adjacent to the existing S-333 structure, which releases clean fresh water south from Water Conservation Area 3A into the L-29 Canal. This additional structure will nearly double the amount of water that can be moved south from S-333 out of Water Conservation Area 3A to about 2,500 cubic feet per second (cfs). "Thanks to the funding received by this agency through Governor Scott, this major component of CEPP will become a reality," said SFWMD Governing Board Chairman Federico Fernandez. "Once these proposed water storage and conveyance projects are complete, water managers will be able to better operate South Florida's flood control system and send additional water south to where it's needed most – the Everglades." Heavy rainfall in May caused the water conservation areas to rise above their regulation schedules and Lake Okeechobee to rise quickly. 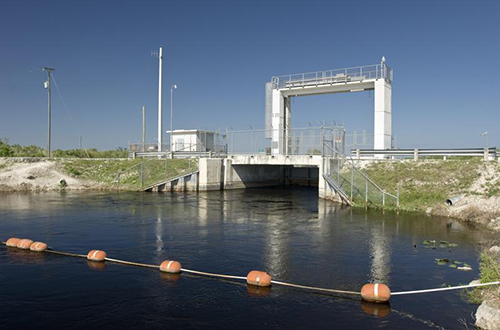 As a result of this high water situation, SFWMD has been utilizing every available structure, as well as temporary pumps, to create capacity within the system for moving additional water south from Lake Okeechobee. This project component will go a long way to helping address high water emergencies in the future.